While planning our wedding in 2013, one of the first aspects I began to think about (after venue, flowers, etc) was how I would ask my nearest and dearest friends to be bridesmaids in my wedding. It may seem like a simple gesture that shouldn’t require much thought — simply a quick phone call or coffee date would do, no? However, living in the age of Pinterest, where you’re overwhelmed with creative ideas (and being an overly-detail-oriented creative), it became a task within itself. After searching all over the web and finding nothing to my liking, I decided I was going to create something of my own! After gathering some inspiration from other creatives on Pinterest, I made my own “package” — each girl received a “Will you be my bridesmaid?” card from the talented Charm & Fig and three additional larger cards I crafted myself. 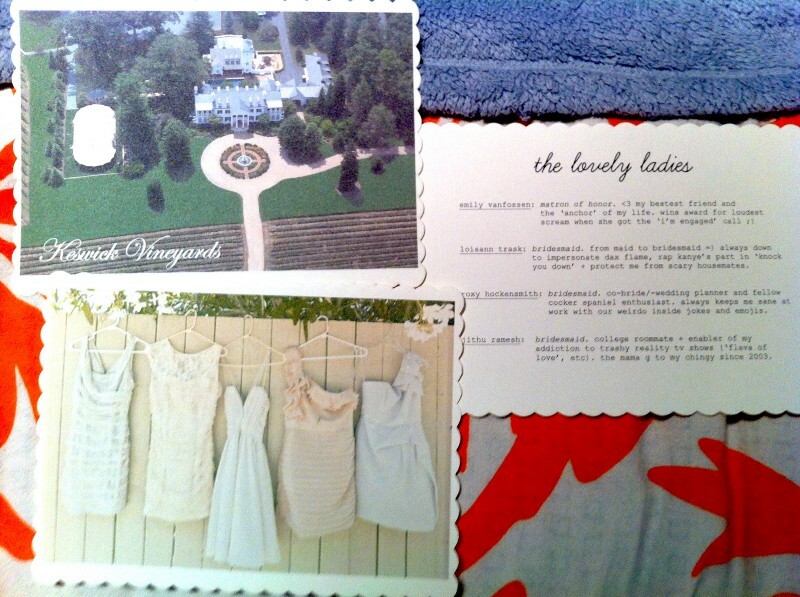 Each card contained information about the wedding and the girls themselves: one for the venue, one about their dresses, and the last one with biographies about each bridesmaid. I also included some paint swatches so that they’d have a good idea of what color dress to wear for the big day. The cards I gave to my bridesmaids — the inspiration for my Etsy shop! Unanimously, my girls loved their cards and uploaded it to every form of social media. I was so excited, and after showing my now-husband, he said to me, “You need to sell these!” It was a lightbulb moment for me — if all these other talented individuals on Etsy could sell their work and do well, surely I could too? It would take a lot of work and precision, but I was willing to tackle it. A month later, after carefully sorting out the right materials and exacting the product, I launched my Etsy shop! It wasn’t easy at first — having to navigate this new world of essentially running my own business. I had to research my market, figure out what was my own cost for each product, price it well (so that I wouldn’t scare away customers, but also not sell myself short) and so on. I also briefly marketed my product through Etsy’s ‘Promoted Listings’ program, which was a wonderful decision in hindsight, as it allowed my shop to gain more exposure within the oversaturated and competitive wedding section. One year after opening my shop, I woke up one morning to an email from Etsy saying that I was receiving a lot of traffic. I logged in to see what was going on, and after clicking around in a state of excitement and panic, found that one of my listings had made it onto a Buzzfeed article! I was elated — not because I was featured in the article, but because it was a validation that my product and work were appreciated and that people actually wanted it! Before I knew it, I was getting a regular stream customers, some even returning when they added a bridesmaid or flower girl! One of my greatest joys (and continues to be) in running my Etsy business are the customers — without a doubt. Of course, I enjoy actually making the product, but it is the interaction with each of the wonderful women I’ve worked with that has kept me going. There have certainly been times where I felt like my work wasn’t “good enough” or felt discouraged whenever I read comments about people saying the idea of buying/creating items to ask your bridesmaid are ridiculous. But as I spoke with each of these amazing customers, as they expressed their joy over getting engaged and how “perfect” my products were for their special day, it gave me a sense of purpose. This was the first time in my life that I had worked for myself, even if it was only in a small setting like an Etsy storefront. With all the other companies I had worked for, I was always given a manual, script or template of how to react to situations with customers. For example, if the customer is angry that something is not what they expected and demand a refund, I was given a protocol to follow in order to resolve the issue. It’s always been fairly easy for me to navigate those waters, since I’ve essentially had guides. However, what happens when you own your own business? How do you handle situations the first time they pop up? Thankfully, I haven’t had any angry customers, but I have had some who have requested last minute changes or needed something overnight. I’ve come up with three main lessons I’ve learned from my Etsy business, which I hope you will find useful in your small business journey! Put yourself in their shoes. This is certainly a no-brainer, but important to be reminded of regardless. Always put yourself in the position of the customer — if you were buying from yourself, what would you expect or hope for from the seller? Nate Holzapfel, co-founder of Mission Belt Co., says it perfectly: “When we truly love our customers and care enough to give them the types of results we would expect ourselves, we find ourselves rich with customers.” I’ve had to do this in several areas, such as creating a “proofs” system where I send drafts to the customers to ensure they’re 110% happy with what I’m making before sending it. This covers my back, and also ensures that they know exactly what they’re receiving! I respond to all messages within a few hours because I’m very aware that some brides may be on a time crunch. Because I hand write all the envelopes personally, if there’s even the slightest smudge of the pen, I immediately throw it out. From an artist’s standpoint, I refuse to give anything to anyone that is below my standards; and, from a customer’s standpoint, I wouldn’t want to receive something that is anything less than perfect, especially for such a huge day, like a wedding! Listen to them. Constantly thinking from the customer’s standpoint, as well as listening to them, puts me in a better position to continue working on bettering my product, as well as expanding my shop. 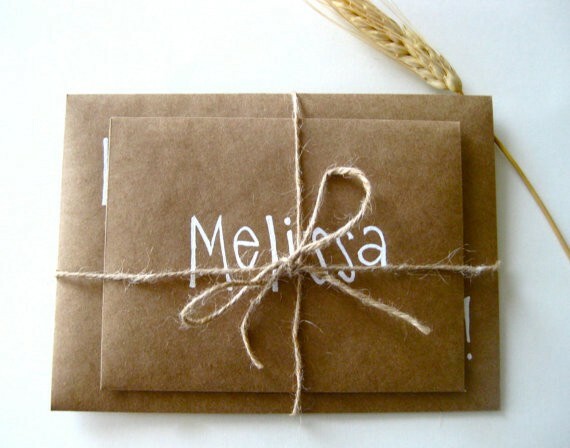 I started out with the packages, which I thought at the time as good enough, but after several women messaged me asking if I’d be willing to just sell the “Will you be my bridesmaid?” card, I knew it was time to create a new listing for it — and it was a hit! Soon after, I introduced painted mason jars, chalkboards and other rustic knick knacks that brides may be interested in for their wedding, which also became quite popular. I also eventually allowed custom orders (for my really creative brides!) and this really opened up the market because it allowed me to also explore some creative freedom in my shop. Be personable. I sought out to build relationships with each of the brides I worked with and ensure that the process was as easy as possible for them (the last thing they need is added stress!) I also worked hard to personalize every aspect of my product, presentation and delivery — such as writing a note to them congratulating them on their engagement and wedding, following up and thanking them if they left me a review, and offering them discounts if they ordered from me again. These women became like friends to me, with some even following me on my personal social media accounts! Regardless of the industry or market you work in, try to make your product unique by coupling it with a willing and friendly attitude — it’s bound to keep them coming back to support you! Support @HelpScout. Wife to @WilliamHerring.